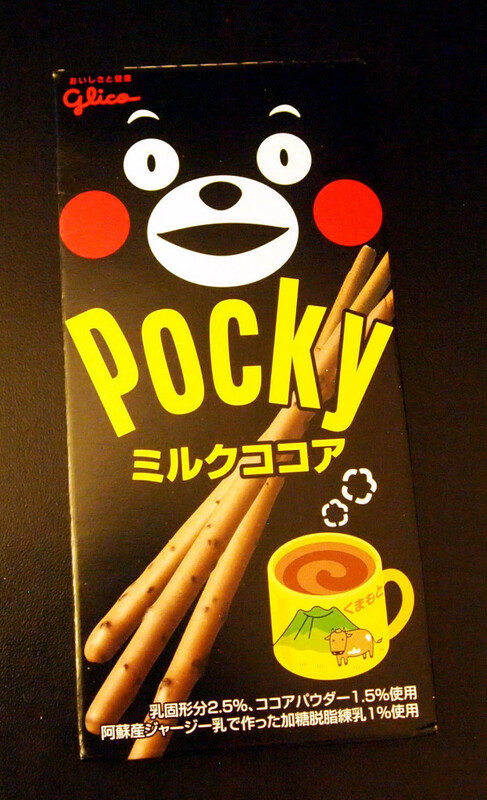 Review: Pocky Hot Cocoa (Kumamon Edition) | Oyatsu Break! Kumamon is the name of the adorable bear who adorns this particular box, and he’s the mascot character for Kumamoto Prefecture, in the north south of Japan… and in case you were wondering, yes, he is the most popular mascot character in all of Japan! He won a vote last year. When I saw him for the first time, I instantly fell in love, he’s just a dopey looking, happy bear. I mean, woohoo! Then I saw him 10,000 more times over the course of the week, as his likeness now adorns literally anything you could think of. Seriously. http://kumamongoods.com/ Apparently this is because you can apply to Kumamoto Prefecture to use his likeness on your product, free of charge! You just have to ask the gov’t first, and then you’re good to go if they give you permission. I can’t get over what a neat idea I think this is, and kudos to the Kumamoto Prefecture folks for doing so. 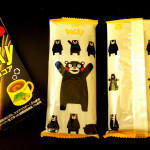 So how then, does the Kumamon X Pocky collaboration add up? Well considering it is Milk Cocoa flavoured (ostensibly from Kumamoto milk!) I’m pretty excited about that, at least, as I think there’s a lot of potential. And hey! The box is totes adorbs. I can’t wait. Packaging: Eeeeeee! I love this derpy bear. Luckily I’ve been practicing my kana so I can read that it’s “Milk Cocoa” flavoured, but the lack of English is a bit of a bummer. 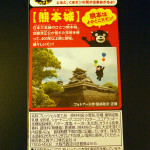 Still, the design is fantastic, and I love the image of Kumamon floating over Kumamoto Castle on the back too. I can imagine any child (heh) would love to carry this around with them! Scent and Taste: Opening the package, the scent really exploded from the package! The milk cocoa is definitely there, though it’s a little sweeter (maybe it’s milk cocoa with marshmallows?). Actually, it smells a little bit like tea-flavoured snacks that I’ve had in the past. 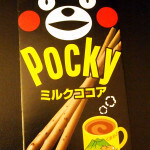 The taste is much nicer than the last bear-themed Pocky that I tried, with a bolder flavour overall. There’s definitely a strong hint of chocolate/cocoa, and the lightly flavoured biscuit stick cuts some of the sweetness making for a nicely balanced taste. 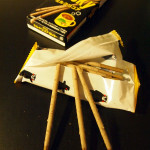 Verdict: This, I believe, is what Pocky should taste like. I mean, sure, the regular chocolate, strawberry, and Banana flavours are great, but this Milk Cocoa is a worthy addition to the team. I still have a few problems, like the slightly oily aftertaste left after polishing off a package, but all in all if I had a sweet craving I’d feel good about grabbing a Kumamon Pocky.